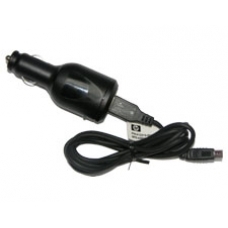 Official HP car charger for the iPAQ 300 series Travel Companion, simply plugs into your car cigarette lighter slot to provide continuous power for your unit - perfect for those long car journeys, or for using the iPAQ GPS. This product includes a USB lead allowing you to sync and charge your unit whilst on the move. * Perfect for GPS Use.